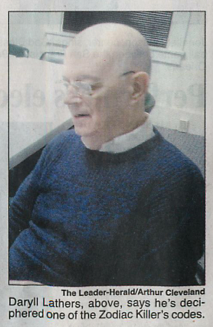 Click above to view the entire article as it appeared as the top story in the Leader-Herald, a local newspaper in Gloversville, NY. The article also appeared online here: Decoding a Killer. 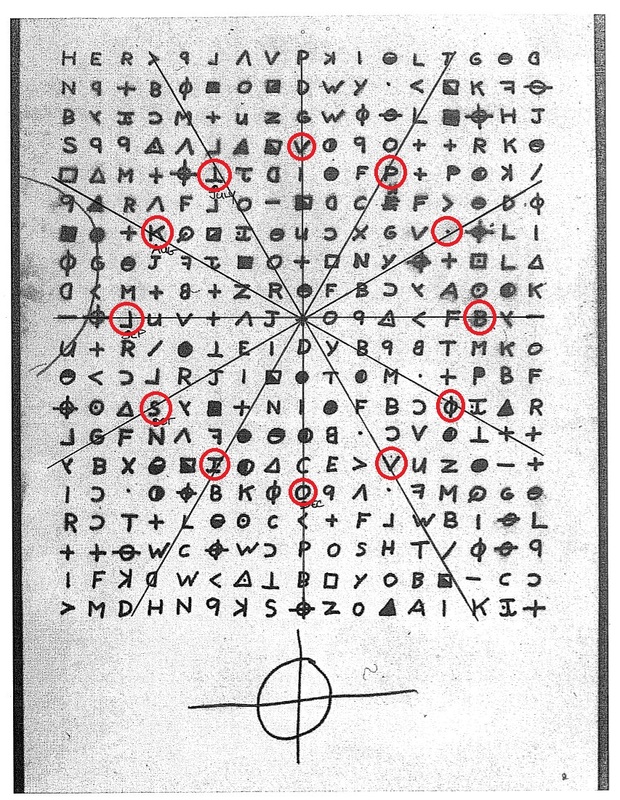 Daryll did not solve Zodiac’s puzzle, and this article explains why. I’m glad people are still trying to solve the cryptograms, but until someone comes up with the real solution, these stories will continue to flourish. A short while back, while examining parallels between the Dripping Pen card and the Bus Bomb letter of Nov 8th and 9th, 1969, respectively, I realized there was a simple mapping between the list of months at the bottom of the Dripping Pen card (“Des July Aug Sept Oct = 7”) and the X-notched reticle (circle+cross) symbol at the bottom of page 6/6 of the Bus Bomb letter. His mapping worked by matching Dec with the 6 o’clock position. Then, moving in a counterclockwise direction, continuing to map the months Jan, Feb, Mar, etc. to the corresponding 5, 4, 3 o’clock positions, continuing until they have been placed so that Nov ends in the 7 o’clock position. Once done, you will notice that each of the months from the Dripping Pen card list (“Dec, July, Aug, Sept and Oct”) is now mapped to one of the X-notches. I was very impressed with Trent’s finding and was thinking about it for awhile. One of the puzzles was to understand what Z meant by an equation that sets the list of months equal to the number 7. At one point, when I was reviewing images of page 6/6 of the Bus Bomb letter, something curious dawned on me: you can see the image of the Zodiac reticle with the X-notches quite clearly through the verso side. I suppose it is possible that this transparency is solely the result of the paper having been treated with special chemicals during the investigative process, but I would like for now to posit that the clarity of the image through the paper was likely deliberate on Z’s part. 1) You could map the list of months to the X-notches in a much more intuitive fashion: you start by placing Dec at the 12 o’clock position, then proceed in a clockwise direction mapping each month to the hour that corresponds to the month number–i.e. : Jan = 1 o’ clock, Feb = 2 o’clock, March = 3 o’clock, etc. And when you are done, the months from the list would once again be mapped to the X-notches. 2) The difference between the page 6/6 image and the page 7 image is really just a transformation by flipping the image on its X axis. 3) We now have a clue to what Z meant in setting the list of months equal to the number 7: he was (presumably) referring to page 7. Page 7, of course, is an anomaly since he labelled the pages as 1/6 through 6/6. In theory, there should be no page 7, but he went to the trouble of making sure there was one. And he conveniently ensured that there would be no writing to obscure the verso image of the Zodiac Killer reticle with the X-notches. So what does this have to do with your post? Please bear with me a bit longer. It occurred to me that the equation–setting the list of months equal to 7–might have another implication besides just pointing to the magical seventh page. Many people have puzzled over the choice of months in the list. Some have supposed they have special significance as months in which murders were committed. Possibly, but it seems to me that the specific months in the list may have only been chosen because they, along with the number 7, allow Z to amount to specify, in a convoluted way, a rather simple transformation rule that can be simplified to “flip the target across its X axis”. Since the recto image of the X-notched reticle happens to reside on page 6/6 of the Bus-Bomb letter, I have been tempted to supposed it has something to do with the Phillips 66 (i.e. : 6/6 => 66) map, but it also occurred to me that, since the 340 Cipher was delivered in the Dripping Pen card, maybe the transformation rule applies in some way to the cipher. Well, that was a long-winded comment (my specialty), but I can finally come to my point: a question for you. Do you see a possible application of such a transformation rule in your efforts to decipher the 340? Nope. Can’t seem to post the link. Interesting ideas! Generally speaking, yes, a transformation rule of some kind may be in play with the 340’s cipher text. There’s certainly something weird going on with the cipher text. So, it can’t hurt to try to reverse suspected transformations of the 340 to see if the resulting re-arranged cipher text can be cracked. Funny this should come up. I’ve been working on the same premise of the months in the post script on the dripping pen card matching the x-notches on the zodiac symbol on the bus bomb letter. I noticed this independently about a month ago. One addition to Gluckman, is that I plotted the “months” on the 340, using the “+” origin, “-” and “-” as the x-axis, and “P” and “Zodiac symbol” as the y-axis. Starting at the “+” in the center, draw a radian at 30 degree intervals. These intervals create 12-lines similar to a clock (in hours or months) that only obviously intersect one symbol in order to create a clock-face or symbol similar to the Zodiac Symbol (circle with a crosshair). I’ve run countless tests on this, such as replacing these symbols with the first letter of their months, the first letter of their zodiac month, only the first letter of those months that were x-notched on the bus bomb letter….and nothing. Got a 32,212 on the decrypto, whoop-de-doo. Personally, I think that the Zodiac put a primer or clues in his letters/cards to solve the 340-cipher. Just like Contact, I think the answer is in his correspondence. so, I’ll keep working on the clock-face / month method until I’ve just plain run out of ideas. One thing I would be interested in is does the frequency or number of symbols change if the cipher is looked at from the rear (as Gluckman said) and then flipped upside down so that O (6-o’clock) is now in the 12-o’clock position to represent December on the clock face. Trying to post another long reply, but keep getting blocked. Email it to me – I’ll post it for you and try to figure out why WordPress is blocking it. Very ingenious. It’s like a diagram written using the presumed cipher as a canvas. 1) Perhaps drawing a clockface makes good sense here. Z’s words were: “The Map coupled with this code will tell you where the bomb is set. You have until Fall to dig it up.” He does add the element of time. I have often been taken by the potential of the Zodiac reticle to be transformed from a diagram with spatial meanings to a diagram with temporal meanings. I could imagine it being subject to other transformations as well: modulous arithmetic comes to mind, but I am sure I have thought of others, in my dreamier states. Could it be that we are not only looking for a location, but a time? Presumably a month in Fall. And perhaps even a time in hours? He doesn’t mention a specific hour, but if it were supposed to have been a time bomb, you would think it would eventually come down to hours. Anyway, all that to say maybe you might be onto something with your clock like diagram. The only other overt clue that Z provided was “PS. The Mt. Diablo Code concerns Radians +#inches along the radians”. What the above text is not showing is a gratuitous, silent character that looks like a little arrow (^) that points upward at the pound/hash/number sign (#). Looking at an image of the original letter, I noticed awhile back that that little arrow is completely superfluous, yet potentially meaningful. When I say it is superfluous, I mean that, at a glance, it looks like it belongs there, but it doesn’t. When we hand-write a sentence or two, but forget to include a phrase, we might typically “insert the missing words by writing over top–above, I mean–the ecpxisting string of words, then add a little arrow underneath to clearly mark the insertion point where the added words are supposed to fit in. At a glance, it looks as though that is what Z did: it’s as if he used the little arrow to mark the insertion point of the pound sign (#), which was squeezed in as if it had been added as an afterthought. It looks rather natural there. But, if you think about it, it’s not. The pound sign is not written above the original string of text, it is squeezed in to a very definite spot. It does not need an arrow to mark its insertion point. Of course, could have been simply put there absent-mindedly, but I suspect Z was quite deliberate about every pen stroke, and I see the potential for meaning. I have been working on a theory that suggests that the arrow represented the arrow on the circle-cross drawn over M t Diablo, and it still may, but in light of your diagram–and your mention of the letter “V”–that the arrow, when transformed through the X axis, so to speak, begins to look like the letter “V”. As to the significance, the arrow in the instructions points to a hash sign (#), meaning a number–as in number of inches. Perhaps in the spirit of transformations, that number is determined by a position on a clockface. Perhaps the position of the reversed Vs.
A follow up step, I might suppose, would (presumably) render a tie-in to the requisite number of inches, as mentioned in the instructions, which when multiplied by the map scale (6.4 inches per mile) would render a radius, perhaps, or maybe a distance along a circumference) to help pinpoint a location. At any rate, it is very late. My imagination is running wild, but your diagram looks like it has potential to me. It certainly changes how I might think about the cipher. Whether it is correct or not, I don’t know, but it certainly is ingenious. I better go back to bed.